Hill Valley High: Highlights - Hill Valley Band Wins Regional Championship! Hill Valley Band Wins Regional Championship! 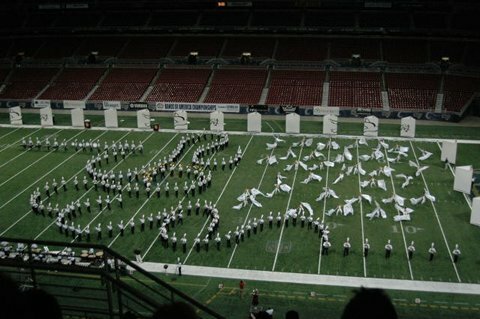 Congratulations to the Hill Valley High School Marching Band for winning the 2009 Bands of America Regional Championship. The competition took place February 7th at Middle Tennessee State University in Murfreesboro, TN. The Hawks won the region title, as well as first place awards for Best Musical Effect, Best General Effect and Best Overall Performance. Hill Valley beat 26 other high schools from five southeastern states. The band is currently preparing for a trip to Dublin, Ireland in April, where it is one of only three bands from the US invited to perform in the annual St. Patrick's Day parade. The Hill Valley High School band features 240 students and is directed by Jeremy Bishop.